I was anticipating the "Red Carpet Sunday" and was really excited to see those A-lister actresses impress millions of silver screen viewers with their exquisite gowns. I was pretty much glued to ABC channel for hours and hours acting like a Fashion Police analyst while the red carpet rolled for kings and queens of cinematography. 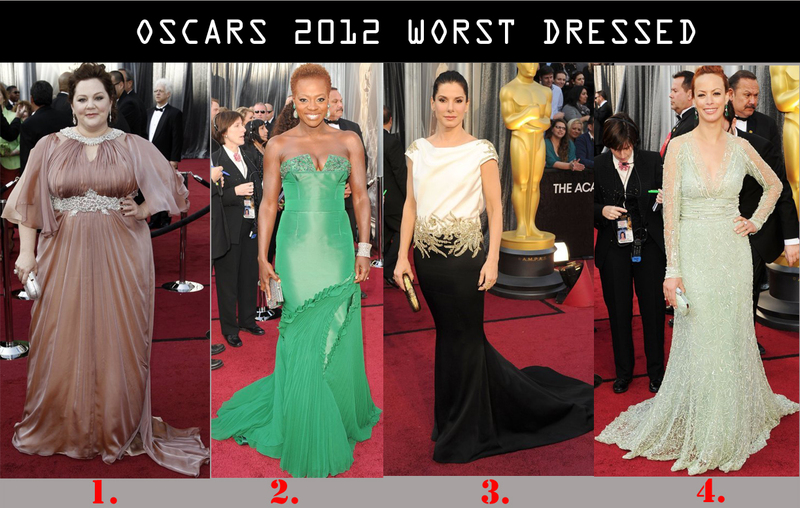 So, I decided to share with you my take on the BEST and WORST dress choices for this Oscar season 2012. 1. Stacy Keibler (George Clooney's girl) made it to #1 in my Rank! She is gorgeous in a form-fitting, draped, off-the-shoulder Marchesa gown. This is not only perfect color for her, but also a perfectly designed silhouette! Thumbs-up, Stacy! 2.Milla Jovovich showed off her softer side in a couture Elie Saab gown with all-over silver beading detail. 3. Jessica Chastain looked stunning in royalty-inspired embroidered Alexander McQueen gown. 4. Gwyneth Paltrow is going for the superhero title in this bright white Tom Ford gown with built-in long cape detail.Very original and unique approach! 5. Angie's black velvet draped Versace gown was absolutely astonishing with a dramatic high-thigh slit. 6. Emma Stone impressed us with crimson Giambattista Valli gown and the oversized neckline bow was sophisticated yet feminine! 7.Missi Pyle made an eco-friendly fashion statement in the Red Carpet Green contest-winning dress, designed by Valentina Delfino, which was made entirely of recycled polyester and silk from cruelty-free silkworms. Two thumbs up for recycling efforts! 8. JLo's stayed true to her revealing nature with accent on curves. 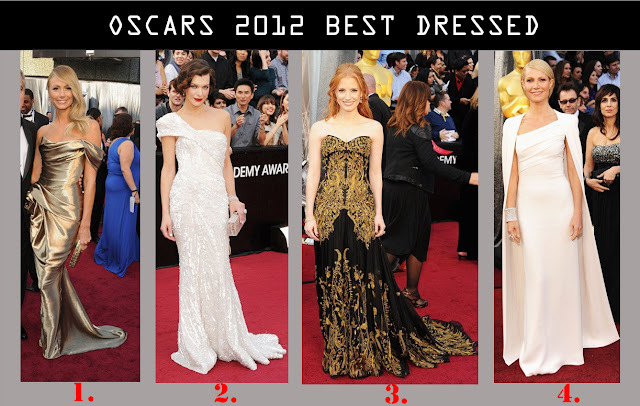 Her gown choice was given to Zuhair Murad, and that dress looked absolutely stunning up-close! 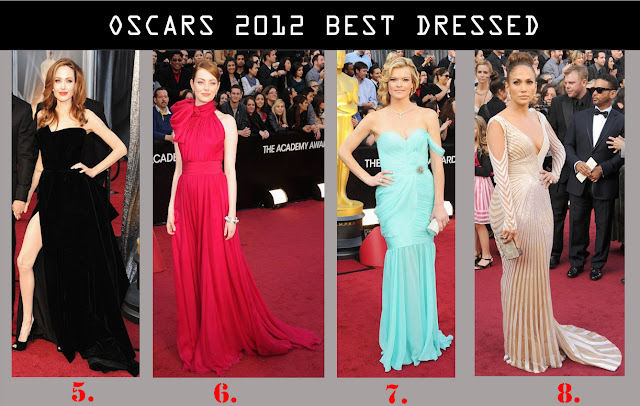 And now, my dear friends, I'll share not so favorite choices...I want to emphasize that the actresses still looked exquisite, I just wish they styled themselves a little better. 1. Even though Melissa McCarthy is my favorite character of "Bridesmaids", however, the dress choice was certainly not so flattering! I heard she studied fashion design and had a vision designed by Marina Rinaldi team. Sorry, but dusty beige and heavy draping only adds volume to her already curvacious figure. 2.Viola Davis is an adorable actress but this green Vera Wang dress has too many details and makes it hard to focus. 3. Sandra Bullock is a fantastic actress. This black and white Marchesa gown is ill-fitting and it's the strange parasitic-looking applique around the waist left us wondering in confusion. 4. Berenice Bejo is stunning, however Elie Saab gown is such a disappointment. The sheer long sleeves and sequin detail are lost in the super pale mint color that does not flatter her skin tone. 5. "Bridesmaids" star and co-writer Kristen Wiig is so talented but looks less exquisite in this blah beige J. Mendel gown. Again, the hue is too pale for her skin tone. 6. Natalie Portman is one of my idols, so the Christian Dior red dress fits her well, however, the polka dot pattern looked a bit inappropriate and too casual for the event. 7. Shailene Woodley is only 20 years old and already a rising star on big screen, however this Valentino Couture gown is way too simple and not age appropriate for her. 8. "Bridesmaids" star Rose Byrne is an amazing talent. This Vivienne Westwood sequined gown is too tight at the top, bunchy in the middle and not doing her flawless figure any favors. 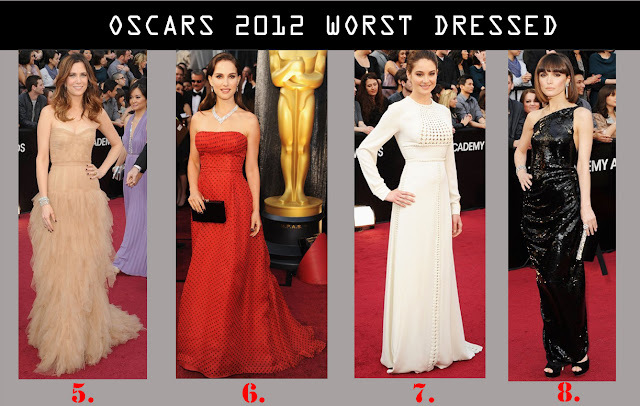 I hope you liked my recap of the Oscar "Fashion" Night. And I can't wait to hear your opinion on these dresses. Which one missed the mark?? Звезды как всегда на высоте! Отличная подборка!